"We want economic fairness, we want economic justice, & we want it now. - New York Governor Andrew Cuomo (joined by Hillary Clinton) upon signing a law that will raise the minimum wage in NYC & its suburbs to $15/hr by 2021 & eventually set a statewide $15/hr wage floor (indexed for inflation & wage growth) for other parts of the state as well. Current minimum wage in NY is $9/hr. "Economically, minimum wages may not make sense. But morally & socially & politically they make every sense, because it binds the community together & makes sure that parents can take care of their kids in a much more satisfactory way." - California Governor Jerry Brown upon signing a law that will raise the minimum wage in California to $15/hr by 2022 with indexation for inflation thereafter. 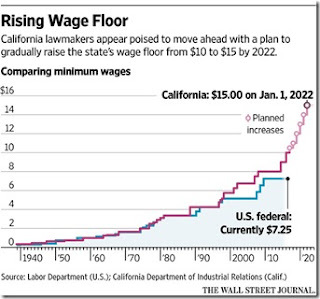 Current minimum wage in California is $10/hr. See graphic below. Neither Bernie, Hillary, or any other proponent of raising the federal minimum wage to $15/hr mentions that such a raise is pre-tax. Taxes – federal, state, & payroll, plus lost or reduced government benefits all lower the $15/hr gross figure received by affected workers. 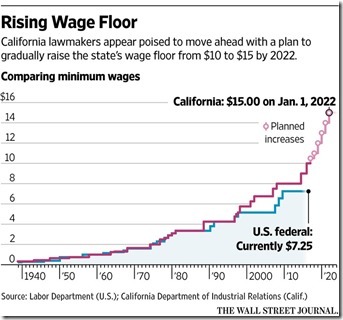 For instance, Henry Schmid, writing in the WSJ - points out that a family of four with both spouses working @ the minimum wage in California (going from $10/hr to $15/hr) would see over one third of the wage increase going to government either as increased taxes or reduced benefits. Mr. Schmid calculates that the couple's annual federal income tax will increase from $4,106 to $7,219, their annual Social Security payroll tax will increase from $2,579 to $3,869, their current $596 Earned Income Tax Credit will be eliminated, California state income taxes will increase from zero to $379/yr, & the annual $2,400 food-stamp credit will be lost. These figures do not include the Medicare tax increase of $302/yr paid by the couple or the $1,591/yr paid by the employer as the employer's half of the Social Security & Medicare taxes on the wage increase – thereby making it even harder to believe the couple would retain employment with this added financial burden on the employer. Add in the loss of other income-dependent welfare programs & added costs due to inflation resulting from the $5/hr wage increase means the $15/hr minimum wage rate is more accurately expressed as the gross hourly wage rate that needs to be corrected for inflation each month of the year. Hardly the way Bernie or Hillary expresses it. government rather than any real increase in economic productivity everyone will be in the same economic position when all the dust settles – except for the people whose jobs are eliminated along the way because of this higher priced economy – i.e., no one who is not worth $15/hr to an employer will be employed @ all. This large an increase in wages will also make it that much harder for America to compete in the global economy. In summary, the government mandated minimum wage is the bottom rung of the pay scale that everyone's compensation is based on – move the minimum wage up 50% & you move the entire pay scale with it. Since the increase is based on government fiat & not value increasing economic principles such as productivity increases you also obtain the resulting inflation that keeps everyone pretty much where they started regarding purchasing power. Union labor contracts peg their baseline wages to the federal minimum wage so that any increase in the federal minimum wage results in union wages rising also. In addition companies with union & non-union sectors also increase the wages of their non-union portion when union wages go up. All of this adds to a rising inflation pressure. ll of the presidential candidates in the two main political parties have tax plans in one form or another but none have detailed spending plans that will make a difference in reducing taxes & the national debt." It is the non-existent spending reduction plans of our Republican presidential candidates that is uninspiring. In this same light the Republican presidential candidates only go so far in promoting their vision of "jobs, jobs, jobs." They talk about undefined economic growth & a promise of possible rising wages. Again uninspiring. an opportunity by an employee to create more present or future value for an employer than it costs to maintain the worker in the job. If the employee's value drops below the cost of maintaining the employee the job disappears & that of course includes minimum wage jobs. This understanding reestablishes the beneficial partnership of employers & workers in that both are trying to create value for each other which in turn means value for their customers. This is the basis of economic growth – a win, win, win situation. This message has to become second nature to the point that every time we hear the term "creating jobs" we understand that only entrepreneurs create value producing jobs & that no entrepreneur has ever had the objective of "creating jobs" – his only motive in starting or running a business is to make a profit. In fact entrepreneurs not only do not want to create jobs they constantly seek to eliminate them. If any jobs are created in the process there is no way to avoid it. This is the mindset needed to restore prosperity to the American people. No other stimulus is necessary. Thanks to Bill Burbage for making this clear. Of course this reverses the brainwashing of the last eight years - none of BO's, Hillary's, or Bernie's policies create one job that results in wealth creation - how do you create sustainable wealth-producing jobs by taxing income? How do small businesses expand when you increase taxes? What economic freedom principles are enhanced when you raise taxes? Answers – you don't, they don't, & none. The Democrat pleas to make the federal minimum wage a living wage is a false hope for many people who will lose their jobs in the process meaning that the real minimum wage for them is zero. Does the American worker only aspire to do government mandated minimum wage menial jobs? If so we should realize we have given up our place in the world already. All that is left is for us to watch the deterioration set in as the global economy swallows us up. Republicans have the chance in this presidential election year to go back to basics & campaign like they really believe it – that the general Welfare of the United States is best served by people – men & women, homosexual & straight, Hispanic, Black, & Asian, – working in the cooperation that is the free market capitalistic system – this is the inclusive message that Republicans never clearly deliver. America's brightest future will be realized when all of the really unclever gamesmanships that BO, Hillary, & Bernie play are not just put aside but are unmasked as the domestic enemy of America that has infected our country with the clear intent of ruining everyone's chance @ the American dream – like pretending that a raise in the federal minimum wage is the answer to a better life for everyone. Republicans have to show government dependent Democrats – "Romney's 47%" of the people who are dependent on government, believe they are victims entitled to government handouts, & pay no income tax - that they are not getting anywhere. Republicans have to positively reach these people to improve their lives with free market policies they undertake. To have any chance to return to the excellence of the prosperity of our founding we have to throw off the collectivist veil – in this case raises in the federal minimum wage - that has been put upon us & once again "secure the Blessings of Liberty to ourselves & our posterity" that allow us to cherish individual rights that are the bedrock of America as defined in our Constitution. 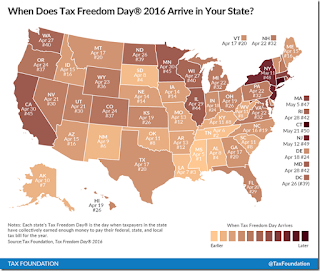 Thanks to Congressman Frelinghuysen for letting me know that "Tax Freedom Day – 2016", the day that taxpayers nationally can finally stop working to satisfy their government obligations, is April 24th, or 114 days into the year (excluding Leap Day) thereby equating to a percentage tax burden of 31%. The congressman also let me know that New Jersey's Tax Freedom Day will not arrive until May 13, later than every other state in the nation with the exception of Connecticut. Since RTE has a ton of readers in NJ & some that I know of in Connecticut I offer my condolences regarding the above results. Tax Freedom Day has been calculated by The Tax Foundation since 1971 under a trademark transferred to it by the originator, Florida businessman Dallas Hostetler. The calculation takes all federal, state, & local taxes & divides them by the nation's income – federal, state, & local individual income taxes (46 days), payroll taxes (26 days), sales & excise taxes (15 days), corporate income taxes (9 days), property taxes (11 days), & the remaining 7 days are spent paying estate & inheritance taxes, custom duties, & other taxes for a total of 114 days. By comparison - in 1910 Tax Freedom Day was January 19 equating to a percentage tax burden of 5%. The Tax Foundation reports: Since 2002, federal expenses have surpassed federal revenues, with the budget deficit exceeding $1 trillion annually from 2009 to 2012. In calendar year 2016, the deficit will grow significantly, from $592 billion to $698 billion. If we include this annual federal borrowing, which represents future taxes owed, Tax Freedom Day would occur on May 10, 16 days later. The latest ever deficit-inclusive Tax Freedom Day occurred during World War II on May 25, 1945. 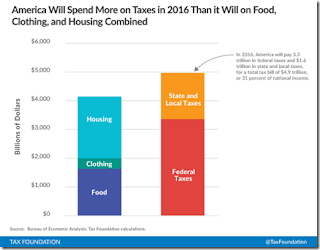 In 2016 American taxpayers will pay more in taxes than the entire American citizenry will spend on food, clothing, & housing combined – see graph below. Check the following graphic to see where your state ranks. Discerning readers realize that Tax Freedom Day does not represent the tax burden of an average American but rather is an expression of the economy's overall average tax burden. Since half of the citizens in the country pay no income tax & many of them receive a rebate for payroll taxes paid through the Earned Income Tax Credit, Tax Freedom Day overstates the typical tax burden of most Americans. But the Tax Foundation explains that "Tax Freedom Day is a significant date for taxpayers and lawmakers because it represents how long Americans as a whole have to work in order to pay the nation's tax burden." 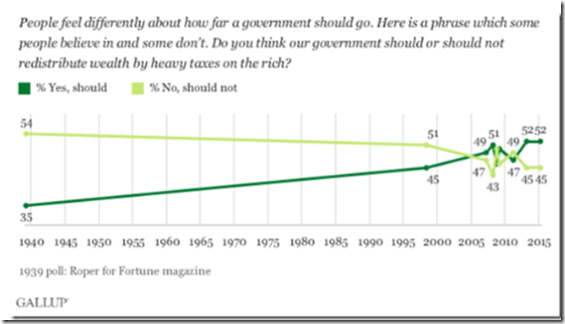 The above explanation of what Tax Freedom Day means & represents reveals why the trend shown on the above graph since 1940 has been persistently up so that now more than half the population believes that the government should redistribute wealth by heavy taxes on the rich. 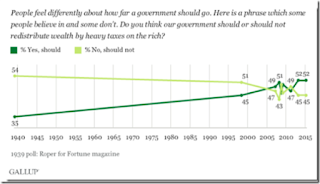 These Gallup results are in line with similar surveys from Pew Research which found that 54% of Americans think the government should "raise taxes on the wealthy & corporations to expand programs for the poor," & that 58% say "upper-income Americans pay too little in taxes." Biggest support for these views are 75% of Democrats, 50% of Independents, 56% of moderates, 76% of liberals, 61% of those making under $30,000 per year, 55% of those making between $30,000 & $74,999 per year, 52% of those 35 to 54, & most disappointingly 59% of those 18 to 34 years old. These stats quite simply show why socialist Bernie Sanders has repeatedly beaten all Republican opponents in head to head matchups for months – if only Bernie can get past Hillary Clinton in the Democrat primary where the super delegates are stacked against him we will speed toward The Road To Serfdom. 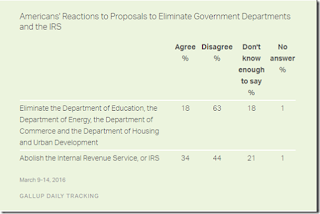 Note below some results that confirm this government favoring trend from Gallup for what Sean Hannity calls a center right country (don't believe that for a second) – only 18% agree to eliminate the Departments of Education, Energy, Commerce, & HUD while only 34% would like to abolish the IRS – not surprising since half the population pays no federal income tax & @ least another 20% pays so little federal income tax that it is not important to them. 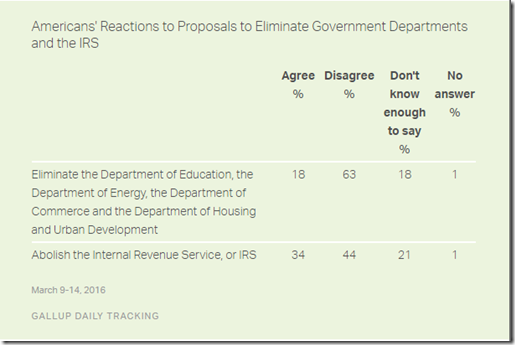 This 70% doesn't realize that unleashing the 30% who are shackled by the federal income tax would provide the stimulus to improve the entire economy & everyone's lives. We can only expect government spending, & therefore taxes, to increase as ObamaCare becomes more entrenched every day. For instance in January 2014 the Pew Research Center found that 47% of respondents thought it was the responsibility of the federal government to make sure all Americans had healthcare insurance & 50% did not. In March 2016, 51% were in favor of government being responsible for healthcare insurance & 46% were not. All of the presidential candidates in the two main political parties have tax plans in one form or another but none have detailed spending plans that will make a difference in reducing taxes & the national debt. Accordingly, the missing point from supply-side economic principles in all these candidates' plans is that the reduction of the size of government & its claims on earned income is what fuels economic growth when coupled with lower marginal tax rates for the highest income earners and sound-money policies. Ellen Sandles, writing in the WSJ, sums this up nicely – "The real crux of our tax exasperation is a spending problem from a government that has grown too big & promised too much to too many for far too long." The "never Trump" establishment Republican freight train reached full momentum (mass times velocity in both physics & politics) last Tuesday in Wisconsin as Ted Cruz (won 48% of the popular vote) - 36 delegates to Trump's (35%) - 6 delegates with no delegates for Kasich (14%). Cruz has a big enough ego (meaning he is just foolish enough) to believe that all of a sudden people are falling in line & voting for his divisive message. Oh please. After instigating the 2013 government shut down Cruz only had the support of Mike Lee (UT) in the Senate before Lindsey Graham (SC) joined the Cruz team out of desperation because of Graham's hatred for Trump. Ninety seven to two among his Senate colleagues says a lot about Cruz's divisiveness. With each losing or proportionately-delegate-dividing primary making it harder for Trump to reach the 1,237 delegate majority needed to secure the GOP nomination before the Republican National Convention in July – with no one else having a mathematical chance to get to 1,237 based on bound delegates – Cruz's & Kasich's roles are that of spoilers to stop Trump so that the activist delegates @ the convention are released to elect whomever they prefer including those currently not in the running – like Paul Ryan. There are really two distinct & separate voting contests going on – one for primary voters which may amount to nothing & one for delegates who have the power to determine each party's nominee. The delegates we see on television every four years @ the conventions are not just there wearing funny hats & partying – we may find out they really mean business that will affect all of us. It has been decades since there has been a contested convention in either party meaning that no candidate comes to the convention with enough delegates to secure the nomination on the first ballot when the vast majority of delegates are required to vote for the state's or district's primary vote winner. But Trump is sensing (as does Cruz & even Kasich) that the delegates are the ones who really make the decision if no one receives 1,237 bound delegates that will secure the nomination on the first ballot. In essence it is Republican party faithful who will decide who the nominee is if the primary voters lose their chance after the first ballot. After all, this is what most of us have been watching our entire adult lives without actually knowing it – the two parties are really taking turns being in power while serving the elites @ our expense. It is truly one big government party with two wings – the Democrats & the Republicans. Both the Republican & Democrat conventions have the job of selecting a nominee that can win the election to keep the party elites in power & money – not to make the voters feel good or represented. Selection of presidential nominees have been determined by different ways but party leaders have always been in control whether people knew it or not. Although there were some primaries before 1968 the majority of national convention delegates were selected by means of state party caucuses controlled by party leaders. In the North Dakota convention earlier this month no Republican presidential candidate had won a North Dakota primary but Cruz made it his business to appear @ the convention & as far as possible secured 18 of North Dakota's 25 delegates with Trump securing none for sure. Cruz is counting on his ground game that is superior to Trump's in this regard. A vivid example of party leaders controlling the selection process involved the Democrat party of 1952 in which Tennessee Senator Estes Kefauver won 12 of the 13 primaries & was the overwhelming choice prior to the national convention; however, the party bosses inserted Illinois Governor Adlai Stevenson who had not even been in the running for the nomination. Of course Eisenhower defeated Stevenson in both 1952 & 1956. Something like this is entirely possible in the Republican party this year with both front runners, Trump & Cruz, despised by the party bosses who just want to get rid of both of them. So all the big guns came out in Wisconsin against Trump pretending to support Cruz. Governor Scott Walker endorsed Cruz – Walker had been an early leader for the Republican nomination & also an early drop out from the presidential race after flip flopping twice on illegal immigration early in 2015 including @ a private NH dinner on March 13, 2015 in which he backed the concept of illegal immigrants staying in the country with a path to citizenship as opposed to his previous no amnesty position. Walker had backed the pathway to citizenship amnesty position for years prior to his reversal earlier in 2015. These inconsistencies caught up to Walker & he now clearly looks ensconced in the Republican establishment below the presidential level – but he had an influence against Trump in the Wisconsin primaries with Republicans. Next Mitt Romney [& by extension (& to a lesser degree) Paul Ryan] bad mouthed Trump to anyone who would listen. This is the same Romney-Ryan ticket that lost Wisconsin by 7% in 2012 as well as Ryan's hometown of Janesville to BO-Biden 62% to 37%. 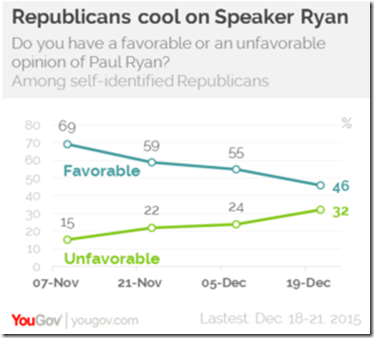 Ryan also lost Janesville in his 2012 simultaneous congressional race 55% to 44%. So Ryan lost his home town twice in 2012 by double digits both times & is now looked @ as the savior of the Republican party by the RNC. Ryan has a favorable rating of 30% among Republicans, an unfavorable rating of 40%, with 29% undecided according to a Fox poll in late March. See graph below to see the trend lines the past several months. Now Romney does not look like someone Republicans should be taking advice from – in 2012 Mitt lost every state he ever lived in except for Utah, one of the most reliably Republican states where he was helped by a heavy Mormon population. Mitt lost his adopted home state of Massachusetts 61% to 37%, Michigan (his birthplace) 54% to 45%, New Hampshire (where he owns a vacation home) 52% to 46%, & California (where he went to Stanford & now owns a home) 60% to 37%, but he won Utah 73% to 25%. In addition, there were third parties like anti-Trump super PACS & the Club For Growth who spent $1 million in Wisconsin on anti-Trump ads as well as Wisconsin talk-radio that plastered the air waves with so much anti-Trump talk that people believed it. 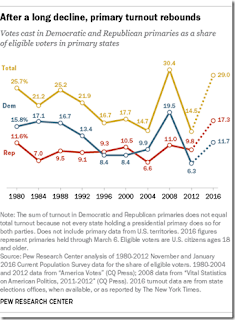 Looking @ the turnout of the primaries shows why the party bosses understand they must maintain control of the nomination process. 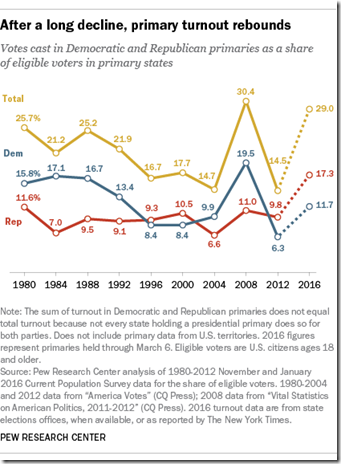 This election year, 2016, is regarded as a high voter turnout year - see graphic below – & it is @ 29% total (11.7% Democrat & 17.3% Republican) of the voting-eligible-population (VEP). The powerful elites cannot & will not let 11.7% or 17.3% of the voting-eligible population control their personal fates – these elites are too highly motivated & have too much @ stake to let this happen. It is the poison of political correctness that has brainwashed the citizenry into continuing the slide of voting for one mediocre candidate or another election after election thereby keeping the two-party political system going – to our disadvantage & ultimate undoing. Accordingly, the partisan Republican activist delegates will not of their own volition nominate a man (Trump) whose positions rock their boat out of the water. They will take any & every opportunity (or ballot) they have to vote against anyone (Trump & Cruz) who is against most of what they believe in. They will nominate someone who represents their values (McCain & Romney the last two cycles & people like Jeb, Rubio, Kasich, & Ryan now) thereby continuing the decline of the American Republic. It is this mindset of political correctness that Trump does away with &, regardless of his position on any issue, it is this mindset change for America that is the biggest contribution Trump brings about to make America great again.